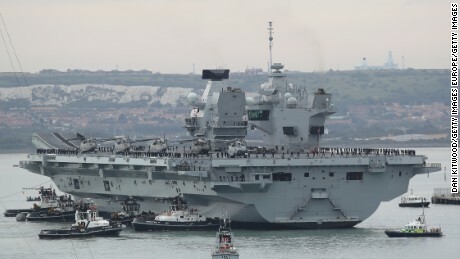 In a speech to the Royal United Services Institute think tank in London on Monday, Williamson said the 65,000-ton carrier Queen Elizabeth — which was commissioned in late 2017 — would also make appearances in the Mediterranean and Middle East along the way as Britain flexed its military muscles post-Brexit. “The UK is a global power with truly global interest … we must be prepared to compete for our interests and our values far, far from home,” Williamson said. The carrier, Britain’s largest and most powerful warship, will carry its contingent of state-of-the-art F-35 stealth fighter jets as well as US Marine Corps F-35s as it ventures into a region where “China is developing its modern military capability and its commercial power,” Williamson added. The combined US-UK air wing aboard the carrier will improve “the reach and lethality of our forces” while “reinforcing the fact that the United States remains our very closest of partners,” he said. The defense minister did not give a date for the deployment. However the Queen Elizabeth is scheduled to become operational in 2020. Williamson said Britain would consider permanent new bases in the Asia-Pacific and Caribbean to exert power globally — reiterating his stance from an interview with the Sunday Telegraph late last year. “For us global engagement is not a reflex reaction to leaving the European Union. It is about a permanent presence,” he said. And last month UK and US warships conducted six days of coordinated drills in the South China Sea. Williamson’s speech came on the same day that the US Navy sent two warships past other Chinese-claimed islands in the Spratly chain to challenge Beijing’s stance. The US has accused Beijing of installing missiles and other military hardware on the disputed islands in contradiction to promises made by President Xi Jinping and against international rulings on the status of the islands. Among the innovations would be “swarm squadrons of network-enabled drones capable of confusing and overwhelming enemy air defenses” that could be deployed this year, Williamson added.